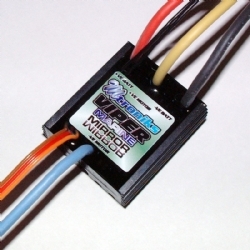 The Viper Marine MIRROR is a Brushed Speed Control designed specifically for use in RC model boats where identical operation in both directions is required, for example a bow thruster! The Marine MIRROR, 'Mirrors' the operation exactly about the neutral point of your transmitter. It also features the new Plug n Play set up which in effect means .... no set up!!! The Speed control learns as you use it and calibrates itself to your transmitter without you having to do anything! The Marine MIRROR has a 25Amp motor limit, what this means is that you can use any, DC Brushed motor, as long as the current drawn by that motor does not exceed 25Amps under load (with the prop connected, under water). The Marine MIRROR is suited to all RC model boats, which means it has all the features that you would expect on a more expensive Speed Control! Features such as a built in failsafe are standard on this Speed Control and the motor stall protection is a feature which cannot be overlooked when a possible encouter with weeds is always a possibility. Plug n Play set up ..... NO set up!! !